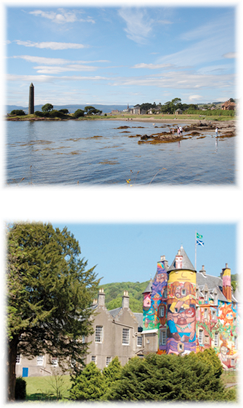 "Stay at the warm and welcoming Willowbank hotel and enjoy Largs, the adventure capital of South West Scotland, where you can walk, golf, sail, wind surf, canoe, cycle, climb and fish." The Willowbank Hotel has the enviable location of being in Largs, which is a beautiful seaside town on the Ayrshire coast. Largs is nestled between the sea and the rolling hills which makes it a haven for water sports including sailing, canoeing and wind surfing, we also have a world famous marina which is the host of sailing regatta each year which attracts competitors from all over the world. If you prefer your activity on the land, then we have 2 championship golf courses, a variety of walks and cycles to suit your ability, Kelburn Country Centre where your wee ones can marvel at the Secret Forest, a town centre with a variety of shops to suit even the most discerning shopper or you can take a short ferry trip to Cumbrae with its breathtaking scenery. There really are too many things to mention, so you'll just need to come and see for yourself.